A-frame Signs placed on the grounds of the Santa Elena History Center in Beaufort, SC, invite those passing by to “Discover Santa Elena” at the museum that opened this fall. Santa Elena was a Spanish settlement that was established in Port Royal in 1566 and predates Jamestown by more than 40 years. And the Santa Elena History Center is a museum dedicated to telling the story of the “missing century” in South Carolina and American History. Housed in the old Federal Courthouse building (which has a history of its own) on Bay Street, the building and grounds are undergoing some modifications in preparation for the inaugural exhibit, which will open in the spring of 2016 to commemorate the 450th year of the founding of a Spanish settlement in the Port Royal Sound area. 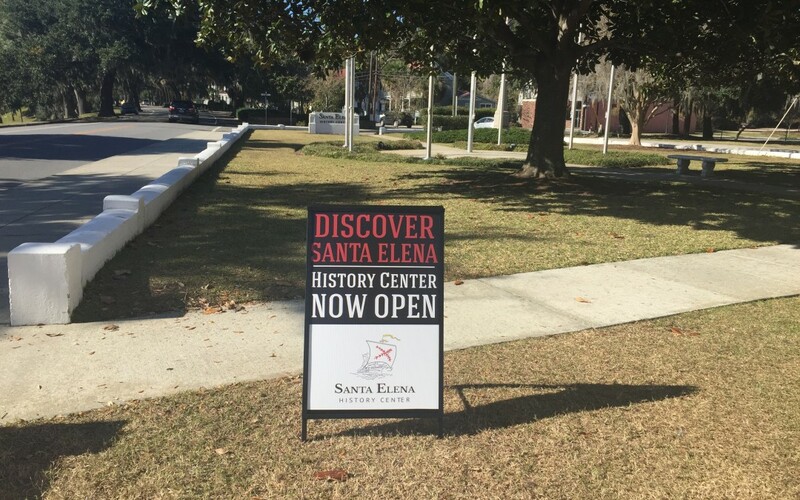 The refaced monument sign now reads Santa Elena History Center, a sandwich board sign reads “now open,” designs for window graphics are being reviewed, a lobby sign is in the works, and a museum panel detailing the history of the building is in production. Currently, the History Center houses exhibits about Santa Elena, the archeology site on Parris Island, and archaeology in general. Additionally, the History Center hosts lectures and events about such topics as 16th century maps, Spanish wines, the art of Jacques Lemoyne, navigation tools of 16th century explorers, Santa Elena archeology, a tour of the Santa Elena dig site on Parris Island, and “Camp Dig It” for kids. The planned inaugural exhibit, which will open in the spring, will be housed on the second floor of the building in a 2,500-square foot exhibit area that was once a stately mahogany-walled courtroom, judge’s chambers, and deliberation rooms. The new exhibition space with interactive displays and life-size museum display panels will chronicle the early exploration of the Florida and South Carolina coasts, the role of different explorers, the establishment of Charlesfort and Santa Elena, and life during that time period. It’s an exciting time at the Santa Elena History Center. The great things happening there are definitely worth discovering, and we hope our A-frame Signs make them easier to discover. In keeping with our nontraditional style for our custom signs business, our space in Port Royal is also unconventional. We are not in a strip mall in Beaufort nor in an industrial park near Bluffton. We are located in a mixed-use building where we have our studio on the ground floor and an apartment with offices upstairs. The ceilings are high 20 feet, the windows are large, the floor is grey painted concrete, and the walls are a canvas, which have been blank until recently. We took care in designing the space because we approached it like a project and worked on it in between our real projects. 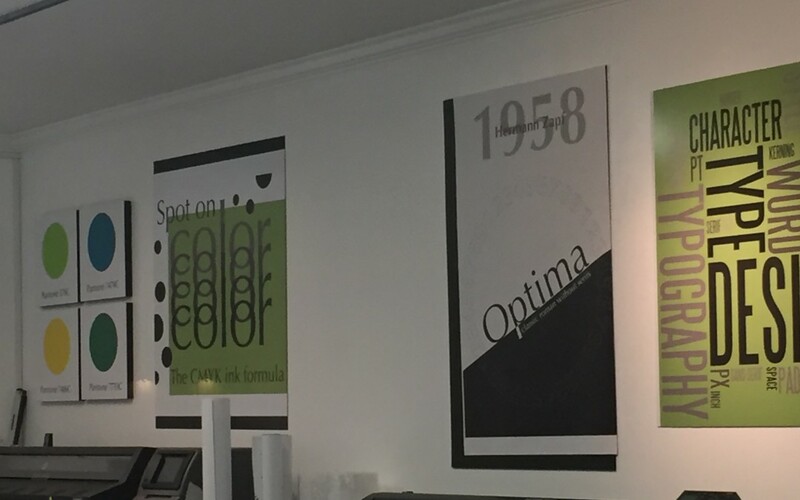 We carefully thought about the purpose of the space—a place to design and craft interior and exterior signage, display graphics, wall murals, and custom wallpaper. We also thought about how we wanted the space to feel. We wanted the studio to be inspirational for our clients and us. We also wanted it to be educational—a place where we display sign projects, custom wallpaper, and museum display panels in an effort educate clients about the best types of materials and creative options for their sign needs. 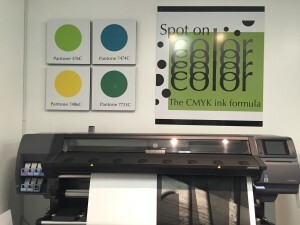 What we came up with is a museum- or art gallery-like space showcasing different types of signs, banners, wall murals, museum panels, wallpaper, artwork on canvas, pop-up banner displays, and back-lit displays mingled with an actual studio working space with a large format printer, laminator, plotter, and work tables. 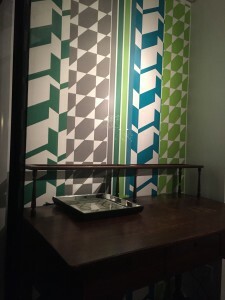 Custom wallpaper pattern printed on two different types of self-adhesive media with different textures. 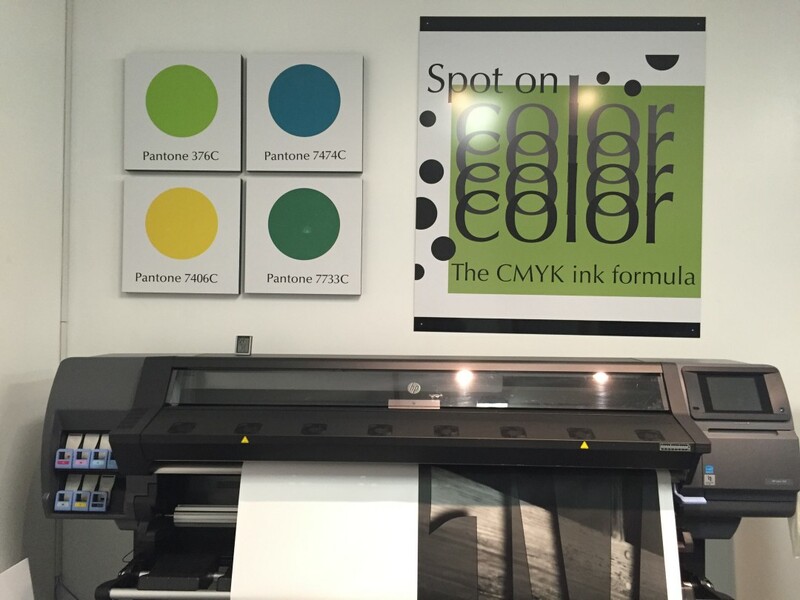 The Pantone colors are mounted on a thick, light-weight display panel, which is an ideal option when you want to add depth in an office, museum, or home environment. The exterior spot color sign is printed on vinyl and mounted on aluminum. Like any museum or gallery, our studio space is a work-in-progress with ever changing projects to put on display. 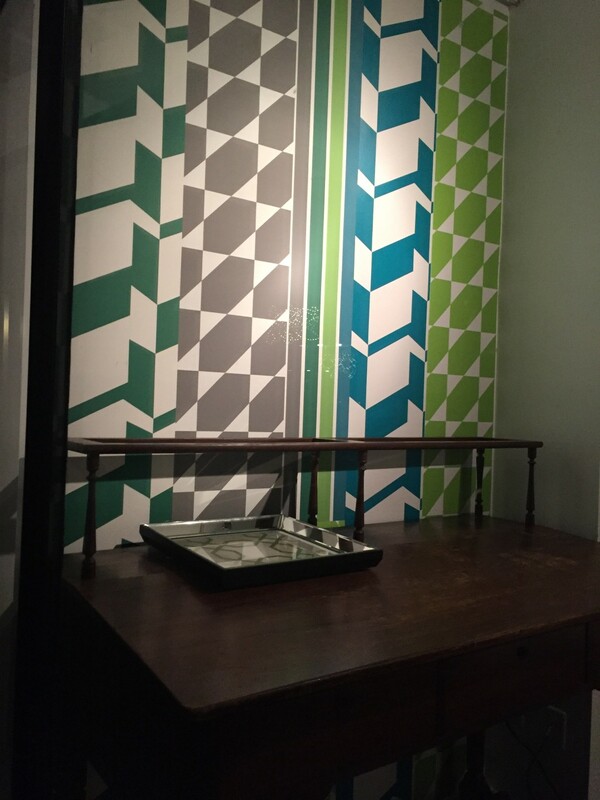 We’ve recently hung some self-adhesive and removable wallpaper, a wall mural, a vinyl sign mounted on coraplast, a vinyl sign mounted on aluminum, a fabric banner with a linen-like texture, and some museum display panels. And we have more projects in the works. Come see what we are doing in the Beaufort area.